Nineteen people died when a boat carrying 150 migrants sank off the coast of northern Cyprus and rescuers were searching for 25 other people, according to Turkey's coast guard. 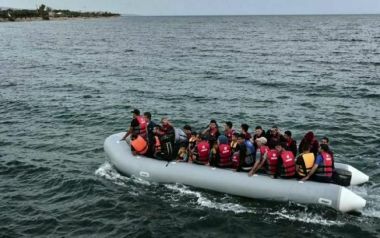 It said 103 migrants were rescued by boats and helicopters of the Turkish and northern Cypriot coast guards, helped by commercial boats in the area, from the sunken boat some 30km off the north Cyprus coast. One rescued person was in critical condition and has been brought to northern Cyprus by helicopter, the coast guard said. It did not say where the other rescued passengers had been taken. A Panama-flagged commercial ship spotted the migrant boat some 25 nautical miles from Turkey's southern province of Antalya and alerted the coast guard on Wednesday morning, the statement said. In 2015, Turkey became one of the main launch points for more than a million migrants taking the dangerous sea route to the European Union, many fleeing conflict and poverty in the Middle East and Africa.